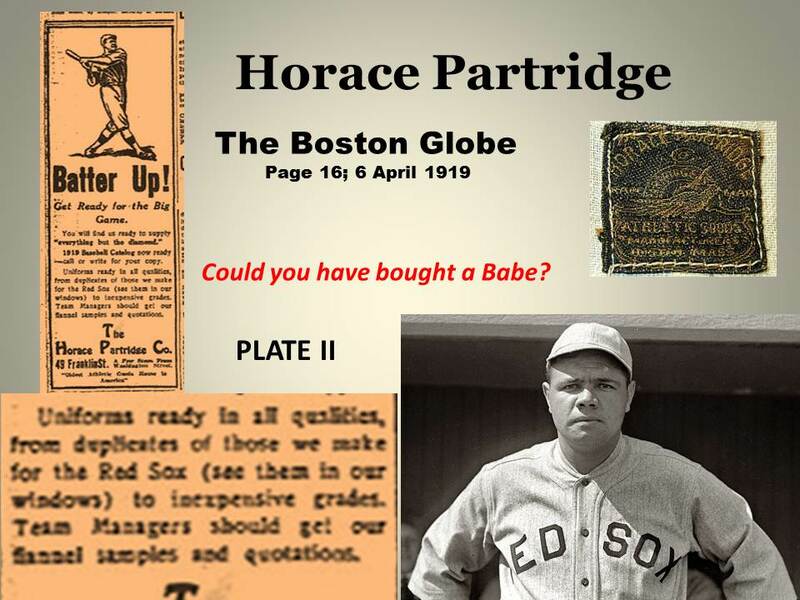 This 1919 Boston Globe ad by Horace Partridge evidences the sale of authentic "on-the-field" gear to the general public. 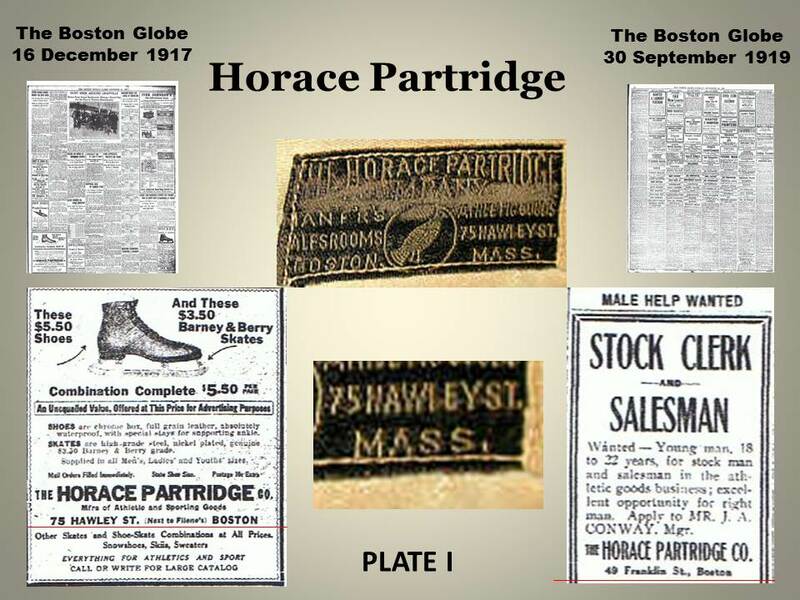 RESEARCH UNCOVERS NEW INFORMATION ABOUT THE RED SOX UNIFORM MANUFACTURER, HORACE PARTRIDGE & CO.
Long before the internet and near-real time information streaming into our lives 24/7, we saw and understood the world via the newspaper. As a uniform collector and researcher, the daily edition remains an invaluable source of information and pleasure for me. As part of researching another project that involves The Horace Partridge Company, I came across some absolute gems that I thought would be well worth sharing. I hope you find them as fascinating as I did. PLATE I: In many ways, we use the style of a manufacturers label to date a jersey. Conversely, in many cases, we date the style of a manufacturers tag by style of the jersey it’s on. What is interesting and rare is when you can confirm the dating of a manufacturers label by period information. Here we can trace a company’s history by location as well as when we should, or should not, expect to see a style of tag and why. PLATE III: The Boston Red Sox began wearing numbers on the back of their uniforms during the 1931 season. It appears this may have been great for fans…not so much for the players or club house personnel. In order to keep everyone on the same sheet of music, or scorecard if you will, the 1932 Red Sox featured uniforms with detachable numbers. Even if the laundry came back late, Smead Jolly would still end up in left field or at the plate wearing #9, making everyone happy along the way. 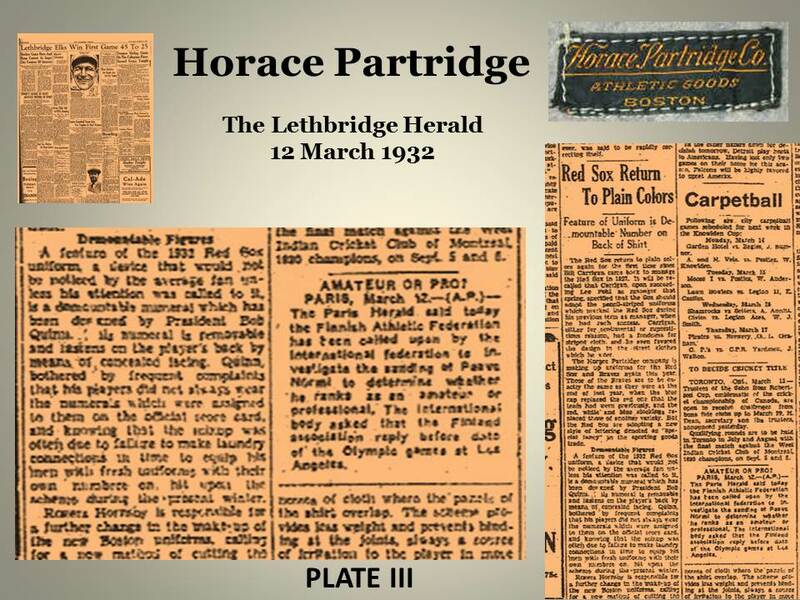 As a side note, this article confirms that both the Braves and Red Sox were outfitted by Horace Partridge for the 1932 season. 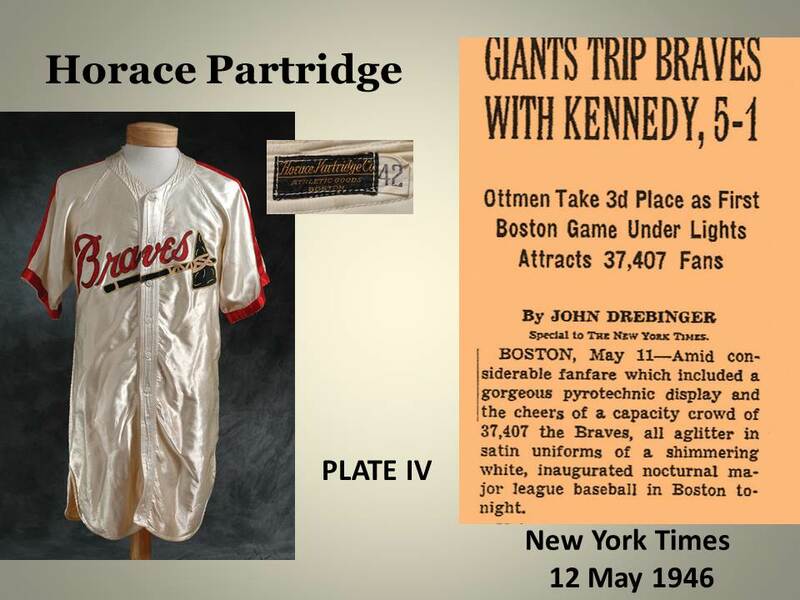 PLATE IV: When the Boston Braves ushered in Night Baseball at home in May of 1946, they did so in satin splendor. Contrary to what is often referenced in auction descriptions or on-line uniform data bases, the Braves began donning this garb in 1946, and not 1948 which is typically the date cited or referenced. Maybe Will Rogers had the right idea when he said “All I know is what I read in the newspaper.” For a man known for spinning simple truths, he appeared to be spot on as it applies to knowing the value of the newspaper and the forgotten treasures about The Horace Partridge Company, and their role dressing up our national pastime. Some more proof supporting the theory that MLB uniforms may have been sold to the general public as early as 1919: This nugget came courtesy of Mike Nola, the official Joe Jackson historian at BlackBetsy.com. It's an advertisement featured in the White Sox 1919 World Series program sold at Comiskey Park. The ad was placed by a Chicago retail sporting goods store named "The Fair," located on "State, Adams & Dearborn Streets." 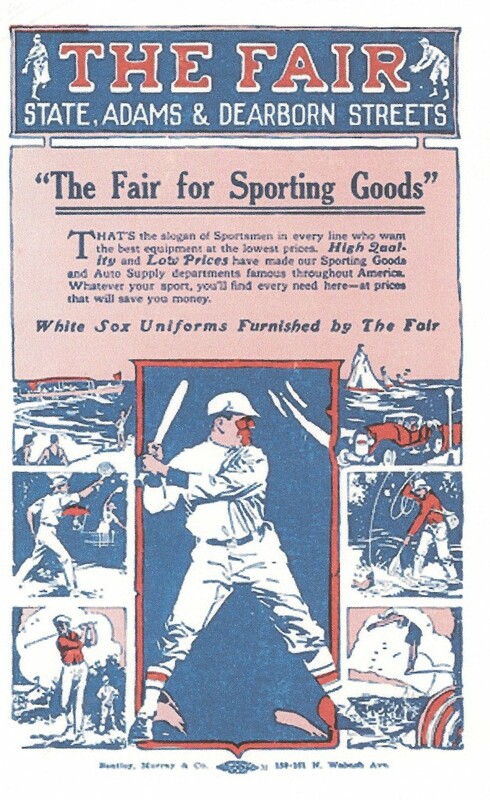 The advertisement prominently proclaims, "White Sox Uniforms Furnished by the Fair." It is well documented that Thos. Wilson and Co. outfitted the 1919 White Sox, so could this "Fair" gear take the prize for first MLB bootlegs? I am stunned. I thought I had a decent knowledge of vintage baseball uniforms. Retail replicas on the market in 1919? I need to re-boot my brain and start from scratch. This is like discovering a deep, dark family secret or exposing a skeleton in my closet. I am embarrassed. I am shocked. Dave, please continue the research! WOW! I wish my grandfather bought a few of these! Fascinating piece. I had no idea! Thanks for the article Dave. Thanks for another fine “Teaching” momment. I wonder how much one of those jerseys would have cost back in 1919? There is an alternative interpretation. The ad is explicitly aimed at team managers looking to outfit their clubs. The uniforms are offered in a range of grades, with “inexpensive grades” at the bottom and “duplicates of those we make for the Red Sox” at the top. The key is what is meant by “duplicates”? It seems to me unlikely that random team managers would be looking to outfit their teams in Red Sox uniforms. This looks to me like what is being duplicated is the quality of the uniform. A team with money to spend would be proud to wear uniforms just as good as the Red Sox. The manufacturer is using their relationship with the Red Sox as a marketing tool for sales to other clubs. Please excuse the delayed response/commentary, but I have been out of town for my Father-Law’s funeral. When I said in my article that it appears you could have waltzed in and bought a jersey, there is nothing that leads me to believe this was not possible. It appears the product was available and on display to the retail buyer. The bigger question is while possible, was it probable? I tend to think that sales of this product would have been extremely rare and here are few reasons why. A professional grade uniform (jersey, pants, cap, stockings) would have run around $17-$19 if not purchased with a team/volume discount. My guess is the jersey would have accounted for about half of that cost or $8.50 to $9.50. While this does not seem like much, this a 16.5 to 18.5 times the cost of a ticket to a ball game (50 cents). Compare this to today, depending on the source, but an average ticket to a ball game is around $30. The fan today can buy an authentic cool base MLB jersey for around $200, or roughly 6.5 times the cost of an average ticket. So with some stubby back of the envelope math/analysis, it would have been 3 times more expensive for an average fan to have bought one of these in 1919. At this point in time, an average bricklayer, painter, plumber, or stonecutter in a large city was bringing home just over $30 a week, so at ¼ of his take home pay for the week, this would have been an purchase in the extreme. Short version. Possible? Yes. Probable? Not likely and even more so for the average fan or baseball patron of the day based on cost and social conventions of the day. I have a “Discount and Charge Coin” from Horace Partridge Co. Found in my backyard with a metal detector. Home dates from 1860’s, southern VT. Coins like this pre-date charge cards but used in the same way. It’s oval, about 1.5″ x 1″, copper or copper plated. Bas relief image of a partridge. Also bears the number of the charge account so, in theory, the original owner could be identified. Anybody have any info on this?